As one of three piers in Nags Head, Jennette’s Pier is probably one of the most popular spots for fishing in the Atlantic Ocean as well as a premium spot to possibly spot a hump back whale – depending on what time of year you visit. But, while it is frequented by those who are looking to catch “the big one,” Jennette’s Pier offers a lot more than great fishing. Originally built in the spring of 1939, Jennette's Pier became the first fishing pier on the Outer Banks. It was built at Whalebone Junction on the site that had been a sort of transient camp for workers hired by the US Civil Works Administration to help construct the sand dunes from Corolla to Okracoke. When the pier was constructed, the workers’ cabins were renovated to provide Outer Banks lodging to the men who traveled to the Outer Banks to fish. Once it was completed the, Jennette’s Pier was over 750 feet long and hosted fishermen for more than 60 years. In 2003, soon after the pier was purchased by the North Carolina Aquarium Society, Hurricane Isabel hit the Outer Banks and washed virtually the entire pier into the Atlantic Ocean – 540 of the 750+ feet of the pier to be exact. The Society elected to rebuild the pier to be bigger and stronger. So, in the spring of 2009 on the exact day of construction of the original pier 70 years ago, the construction began on the new pier which would be made of concrete and extend a full 1,000 feet out (25 percent longer than the original pier). This pier, along with being an ever popular spot for fishing, now has an educational twist to it and is absolutely fascinating for visitors and locals alike to visit. Finally completed in 2011, the new and improved Jennette’s Pier is definitely worth a planned visit while on Outer Banks vacations. There are several educational elements added to make it more than one of the best places to fish (which it definitely is). There is also a 16,000 square foot pier house that sells drinks, snacks, tackle, gifts and more. The North Carolina Aquarium Society takes its purpose to another level to make it fun to visit and make people want to come back. Fishing. Of course, people still fish from the pier. After all, it is a top fishing spot where seasoned fishermen and those out to try it for the first time catch bluefish, red drum, king mackerel and more. But at Jennette’s Pier, there are opportunities to take fishing classes for beginners, experienced anglers and even a weekly hands-on lesson called “Catch It, Clean It, Cook It” and we are here to tell you that you learn to do it all – even fillet it. It is a morning event that culminates with frying up the caught fish for lunch with the group. YUMMO! There is nothing like freshly caught fried fish dipped in a little fresh tartar sauce for lunch. Green Energy. When the new pier was designed, the intention was to use “green energy.” That is exactly what it does. There are three wind turbines above the pier’s wooden deck. These turbines produce enough energy to fulfill almost half of the entire facility’s electric needs. On top of that, one of the shade pavilions is covered in something called photo voltaic cells. Simply put, this coverts sunlight to electricity that is stored in a batter pack used to power the lights on the pier at night. There are also green systems in place to run the HVAC system in the pier house and the water system used for washing down the decks on the pier as well as the plumbing. A little statistic about how well the water conservation system works reveals a projected reduction of the use of municipal water by 60 to 80 percent. Education. The North Carolina Aquarium Society has always had education at the forefront the pier’s reconstruction. From school field trips to the pier to outreach in schools, Jennette’s Pier brings a plethora of knowledge and science to the table for kids of all ages to learn and grow. There is a variety of programs from ways to conserve energy to marine biology and other science oriented activities that students love to see and, more importantly, participate in building things and figuring out how it all works. The new and improved Jennette’s Pier offers something for everyone. The $25 million price tag on the reconstruction brings so much more than fishing (albeit the pier is a great place to fish) and hanging out on the pier to possibly catch a glimpse at a whale or other big fish. It is important to note that there are fees for passes associated with fishing off Jennette’s Pier but even the $2 donation to walk down the pier is worth every penny. Outer Banks vacations should definitely include a trip to Jennette’s Pier in Nags Head whether just walking out to the end for pictures, spending some time in the peace and quiet, or fishing to catch dinner. It is absolutely fascinating to see and truly be part of the wide Atlantic Ocean. August 29 through September 2 – Wave Riding Vehicles Outer Banks Pro Presented by Hurley will be returning to Jeanette’s Pier in Nags Head. This surf competition is a part of the Western Atlantic Surf Series and has a total purse of $30,000 in prize money. Admission for the public is free. September 1 – If you are a fan of American Idol, then the Concert in Manteo is for you. Not only is Scotty McCreery the youngest male to ever win American Idol but he also won the New Artist of the Year in 2011 at the American Country Awards and the 2012 Academy of Country Music Awards. He is even in the Guinness World Records book for being the youngest male to ever get a No. 1 album on the all-genre chart with a debut release. You and family will not want to miss out on seeing him perform. Tickets for the concert, which is held at the outdoor pavilion at Roanoke Island Festival Park in Manteo, are $25 for advance tickets and $30 for the day of show. September 4 -5 - OBX Arts and Crafts Festival will be held in Kitty Hawk at the Hilton Garden Inn. If you are a creative person, then attending this event on your Outer Banks vacations is a must for you. This event features creative works from glasswork and metalwork to pottery and paintings to handmade soap and jewelry. A portion on the proceeds will go to the Network for Endangered Sea Turtles and the Hosea House which are local charities. Admission and parking are free. September 14 – Outer Banks Bootcamps presents the 4th Annual “All Out Pink” Road Race. This race gives you two courses to choose from. One is the 12K bridge run and the other is the 5K run. Every penny of the event goes toward providing local women with mammograms and gives men access to health care. The race admission is $35 to participate in either race. If you are participating in the race you will also be given a t-shirt, access to the post-race garden party, chip timing and a finisher medal. If you would like to attend as a spectator, admission is $15 for children 13 and up. September 15 – 21 – The 46th Annual Eastern Surfing Association (ESA) Eastern Surfing Championship will be held at Jeanette’s Pier. This surfing association has been around from 1967, and has been responsible for debuting some well-known surfers. The ESA originally started to protect the sport of surfing along the East Coast and grew into an association with a current membership of 10,000 surfers. Admission to the public is free. If attending events isn’t your thing, there is also fishing at the Pier, going to Corolla to see the wild horses and relaxing at the beach. Beach time in September is perfect time of year to enjoy. The weather cools off some and the water gets warmer. For more information about our Outer Banks vacations homes, contact us at 877.858.4795. When it comes to fun in the sun on summer vacations Outer Banks outdoor recreation brings some of the most fun you will ever have. Whether you like to simply spend a week or two lounging by a pool or stepping outside your comfort zone and doing something exhilarating, there are so many endeavors that keep you outside and active. While OBX vacations offer so many outdoor fun activities, as locals, here are a handful of the things we love to do. Yes, you can ride bikes most anywhere you live but there is something different about riding bikes on your Outer Banks vacations. Whether you want to hop on a beach cruiser to casually ride along the bike paths or along the surf, or you are a serious cyclist who intends to head out every morning for a three-hour ride, the OBX is a great place to spend time exploring the barrier islands as it is mostly flat with a few bridges. A couple of suggestions for casual and family bike rides are to stick to the paths that traverse through the different areas of the OBX. Some go from town to town making it a great mode of transportation for heading out to eat. Also, be aware of those on foot and extend them some courtesies. For intense cyclists, stay off the bike/foot paths as there are wide shoulders along the roads on the OBX – just make sure to ride with traffic as you are treated as a moving vehicle and must abide by the same rules of the road as motor vehicles. “Water, water everywhere” is the mantra for most of the OBX activities. There is nothing like gliding through the water either in a kayak or on a SUP board to see sea life swimming below you. The amount of waterways that crisscross through the barrier islands offer tons of places to climb aboard and have some fun all while getting a great workout. The inland waterways (sounds) that separate the OBX from the mainland as well as the waters through the wildlife refuges are perfect for casual excursions and tours while the Atlantic provides some exciting action for experienced SUP surfers and kayakers. Both activities deliver great workouts without feeling like you are working out…at least until the next day. Have you ever just sat on the beach to watch someone kiteboarding? As an observer, it always looks so easy but it is a very hard work out that like SUP boarding or kayaking is just as fun as it is hard. Kiteboarding on the OBX is as popular as surfing. In fact, the OBX is home to the Triple S Invitational in Cape Hatteras. But do not let the extreme sport on the ocean scare you. The Outer Banks has so many sounds that are ideal for beginners who want to kite surf with winds and currents that work well to get you in the groove with a kite board. Then, when the true adventure seeker in you comes alive, head over to the coast and really kick it up a notch. Of course, we have to mention this age old activity (and sport) on the OBX. There are so many places to fish and so many ways to do it. From simply taking a rod and some bait out to the end of one of the piers to spending the day out in the waters deep sea fishing, this is always a favorite activity for locals and visitors. From several of our vacation rentals Nags Head Pier is a short walk and a great place to take the kids. A more recent way to fish is to go out into one of the sounds on a SUP board and fish off of it. When out on a SUP board, it is absolutely amazing what you see so why not take advantage of it, stand up in calm waters and catch dinner – all while getting a great core work out! While we listed a few of our favorite things to do, there are truly too many activities to mention. The best thing to do is think about what you really enjoy and what you want to do, then make a plan. Most importantly, since you are on vacation, no matter what you do, have fun! The Outer Banks is one of the best places to go on vacation on the east coast, and it is a perfect setting to create family memories. From walking along the beach and building sandcastles to fishing from the pier and skimboarding, there are many activities for your family on OBX vacations. Your family can start a beautiful day by watching the sunrise over the Atlantic Ocean. Or watch the sunrise from the back deck of your oceanfront or oceanside house, from one of the numerous piers along the Outer Banks, or from the beach. After seeing the brilliant view of the sunrise, enjoy breakfast at a local restaurant. Spots that serve breakfast include Duck Donuts in Corolla, Duck, Kill Devil Hills, and Kitty Hawk; Stack'em High Pancakes in Kitty Hawk and Kill Devil Hills; Henry’s Restaurant in Kitty Hawk; and Southern Bean in Kitty Hawk. Enjoy free public parking in towns such as Kitty Hawk, Kill Devil Hills, and Nags Head. Activities to enjoy OBX vacations include swimming, surfing, skimming, boating, paddleboarding, bodysurfing, and kayaking. Visit local surf shops such as Kitty Hawk Kites and Kitty Hawk Water Sports to rent equipment or to join lessons from experienced professionals. Your family can also enjoy playing in the sand, building sandcastles, fishing along the shore or on the piers, flying kites, and playing with frisbees or beach balls. If your family is interested in taking a pet to the beach, the beaches in Duck are some of the best places to go. We have many pet-friendly vacation rentals for your family. Visit our page for pet owners: http://www.atlanticrealty-nc.com/pet-friendly-outer-bank-rentals. There are great restaurants to visit for lunch while on OBX vacations. Great local restaurants for lunch include Black Pelican, John’s Drive-In, High Cotton Barbeque, and Rundown Cafe in Kitty Hawk; Slice Pizzeria, Kill Devil Grill in Kill Devil Hills; Sunset Grille & Raw Bar in Duck; and Tortugas’ Lie in Nags Head. Try a variety of local restaurants during your OBX vacations. After refueling in a local restaurant, visit one of the many famous historic sites during OBX vacations. Don’t miss the Wright Brothers Memorial to learn about how the Wright Brothers invented the first successful airplane in the world. Enjoy The Lost Colony performance in Manteo. The entertaining and educational play, which recently received a Tony Award, tells the story of the first English colony in America. You can take a guided tour of The Lost Colony as well. You can also visit Jockey’s Ridge State Park in Nags Head. The park consists of the highest sand dune located on the East Coast. There is plenty more history and nature to learn about on OBX vacations. After your family has soaked up the sun and taken in the local sites, enjoy an excellent dinner at a local restaurant. The Dunes Restaurant in Nags Head, Kill Devil’s Frozen Custard & Beach Fries, and Carolina Seafood Buffet in Kill Devil Hills, and Fisherman’s Wharf in Wanchese are among the great options for your family during OBX vacations. OBX Vacations have a large variety of activities to join as well as many historic sites and local restaurants to visit. Contact Atlantic Realty at 877-446-4767 for more information on rental homes and family activities. If you have not already gotten your tickets to see Blues Traveler, you better do so!! They are performing July 25th at the Roanoke Island Festival Park Outdoor Pavilion in Manteo. There is no better way to see this hugely popular band than on the lawn in beach chairs. Stand up and dance to “Run Around” or relax with a cold beverage while listening to “Carolina Blues” (must play at this concert). No matter what song you want to hear, Roanoke Island Festival Park’s Outdoor Pavilion is the place to go on July 25th. Gates opening at 5pm and the music starts shortly after that. Richmond’s own Pat McGee Band opens the entertainment at 5:30 with Matt McGuire & the Wilders following at 6:30. Matt McGuire frequents the Outer Banks and has a large loyal local and regional fan base. This line-up is exceptional and will prove to be a great night for music lovers. This concert is a great way to end a fantastic day. Outer Banks vacations are filled with fun in the sun, searching for pirates and even an historical tour of the first settlers to discover the new world. A trip to Roanoke Island is a great way to spend the day. Make a day of it by heading to the Park and enjoy an afternoon exploring the Elizabeth II, the Roanoke Adventure Museum, and an American Indian Town or meander around Manteo. Whether on summer vacation at one of our Outer Banks vacation rentals or someone who lives here all year long, there is no better way to cap off a Thursday than by spending the evening with one of our most loved music groups. Tickets can be bought in advance for $30 (plus tax and fees) through the Brew Thru website or at any Brew Thru location but are limited in the number available and $35 (plus tax and fees) at the door. Food and drinks are available at the event so just bring a chair and be ready to dance to all of the Blues Traveler favorites. Blues Traveler is one of the most loved bands that got their start in the late 1980s and their first Grammy for none other than “Run Around” on 1995. In fact that chart topping single still holds the record for longest-charting single ever in the history of the Billboard charts. Since their start, they have entertained over 30 million fans at about 6,000 shows. This concert is an extra special one as the last time Blues Traveler was performing here, a hurricane changed everything. So here we are several years later looking forward to one of the most loved groups. For anyone planning a last minute week at the beach, the last week of July is a great week to spend on the Outer Banks. If the pick is a Nags Head vacation rental or one in any of the other towns, we can help with the plans. There are still options out there. Call us at (877) 858-4795 or email us to get information on planning an OBX vacation or to make reservations. The Lost Colony production tells the story of our country’s history, including the exploration of the New World and the creation of the first colony by England. The Lost Colony, which is known as the country’s longest-running outdoor symphonic outdoor drama, received a Tony Honor in June. The American Theatre Wing presented the 2013 Tony Awards on June 9 in at Radio City Music Hall in New York City. The production has been awarded the Tony Honor for Excellence in Theatre, and it is awarded to individuals or organizations who have contributed to theater in America but who are not qualified to receive a normal Tony award. The Tony Honors were presented a day before the Tony Awards during a private reception. “The Lost Colony” performance is the only theatrical production located in North Carolina that has been awarded an honor like this. The Lost Colony play premiered in 1937 in Manteo, and the play continues to be in production every summer. It started with one of the New Deal programs that were created by President Franklin Roosevelt. The play is produced by the Roanoke Island Historical Association. The production takes place at the Waterside Theatre in Manteo, and more than four million visitors have seen the performance. The 76th season of the performance will take place this summer. This year, the performance will be from May 31 to August 23 and is a must see for visitors enjoying their Outer Banks vacations. In the late 16th century, Sir Walter Raleigh became the leader of England’s expedition in the New World. Raleigh financed an expedition to the New World to establish land for England. Captains Philip Amadas and Arthur Barlowe traveled to the New World to find a location for England’s colony. England chose Roanoke Island to be its primary New World colony. Queen Elizabeth gave Raleigh a patent for lands. The first group of colonists arrived in 1585. Scientist Thomas Hariot, who created the first science lab of the New World, and artist John White, who created maps and drawings of the Indians and the new colony, were among the colonists. The colony was abandoned a year later due to reasons such as conflict and a lack of enough supplies. Another group of colonists arrived in 1587, and about 115 English settlers were in Roanoke Island. In the same year, the first English baby to be born in the New World, Virginia Dare, was born. White, who became the governor of the colony, returned to England. Although White wanted to come back to Roanoke after he collected more supplies, England and Spain were at war. Therefore, he could not return yet. When White returned to Roanoke in 1590, he realized the colony disappeared. White only found a carving that said “Croatoan.” He tried to find the colony, and theories have been created about what happened. Investigations have continued to take place, but the colony’s disappearance remains a mystery. Atlantic Realty's Fun 'N Sun program includes a complimentary adult admission per day to the Roanoke Island Festival Park. This offer is available from March 1 to December 31 of 2013. You do not have to make a reservation. In addition to visiting the Lost Colony on your OBX vacations, you can also see the Elizabeth II, a sailing ship, and exhibits on display at the Roanoke Island Festival Park. You do not want to miss the opportunity to learn about the history of the explorations of the Roanoke area and the Outer banks. Atlantic Realty’s rental program is introducing new Outer Banks vacation rentals in 2014. Atlantic Realty is proud to provide you with a relaxing stay on the Outer Banks in one of our Outer Banks vacation rentals. Contact Atlantic Realty to discuss dates and prices for pre-reservation of these beautiful Outer Banks vacation rentals. Ocean Paradise is one of the Outer Banks vacation rentals located in the Villages at Ocean Hill in Corolla. You can enjoy beautiful views of the Atlantic Ocean and visit the beach. The house has eight bedrooms and seven-and-a-half bathrooms. It also has a screened porch and a sun porch. You can have a meal outside while enjoying the ocean views. The house also includes a private pool and a hot tub as well as lounge chairs by the pool and on the deck. Ocean Paradise is very spacious and includes an elevator. Other rooms include two dens, a sunroom, and a game room with a pool table. Wireless Internet access and 10 televisions are available as well. Ocean Paradise is located in Corolla, which is part of the Northern Outer Banks. The Villages at Ocean Hill have a variety of community amenities that are available for guests of Outer Banks vacation rentals. These amenities for guests of Outer Banks vacation rentals include tennis courts, an Estuary Trail, and a fitness center. 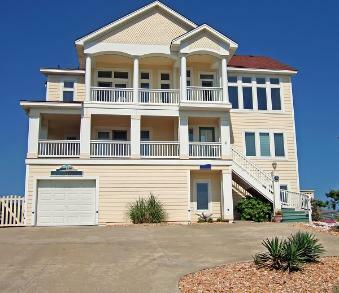 Ocean Paradise is one of the Outer Banks vacation rentals in an ideal location in Corolla. It is a short distance from Corolla's famous wild horses. The wild Colonial Spanish Mustangs can be found on the beaches of the northern Outer Banks. Ocean Paradise is also close to the Whalehead Club, a historic museum located inside Currituck Heritage Park. Visit http://www.whaleheadclub.org/ for information on upcoming activities for family members of all ages. In addition, the Currituck Beach Lighthouse is a few steps from the Currituck Heritage Park. You can climb the steps of the lighthouse and see the beauty of the Outer Banks. Other activities in Corolla include kayak tours, fishing, and surfing lessons. If you are staying in one of the Outer Banks vacation rentals in Corolla, you do not want to miss the entertaining activities for the family. Seacloud in another one of the beautiful Outer Banks vacation rentals, and it is a four-bedroom oceanfront house in South Nags Head. The ocean is a few steps from the house, so you can visit the beach at any time during your vacation. The kitchen has been newly remodeled. A gas grill is included for you to enjoy a dinner made on the grill. The house also includes five televisions, and each has a DVD player. Wireless high-speed Internet is available as well. Seacloud, a beautiful house that is part of the Outer Banks vacation rentals, will provide you with a comfortable and peaceful stay in South Nags Head. Coolangatta is an additional one of the Outer Banks vacation rentals, and it is located in South Nags Head. It is an oceanside house with four bedrooms and two baths. The house provides a peaceful atmosphere, ocean views, and a nice sea breeze. The sun decks and the crow’s nest on the roof provide a relaxing area to view the ocean from the house. A screened porch with a swing is also a nice setting for the sea breeze. Coolangatta will provide a relaxing vacation in South Nags Head. South Nags Head has a variety of activities for guests of Outer Banks vacation rentals, and South Nags Head is close to many historical places to visit. Seacloud and Coolangatta are Outer Banks vacation rentals that are located near the historical Jockey’s Ridge State Park. Jockey’s Ridge is the tallest natural sand dune system located in the eastern part of the country. Nags Head features a variety of art based on the town’s heritage and history. These Outer Banks vacation rentals are also a short distance from the Nags Head Woods Ecological Preserve. As you visit the beautiful beaches by the Outer Banks vacation rentals, you can visit Jennette’s Pier, the Outer Banks Fishing Pier, and the Nags Head Fishing Pier. Each pier offers a unique variety of activities, and you do not want to miss them. South Nags Head has many entertaining activities for those who are staying in the Outer Banks vacation rentals. These Outer Banks vacation rentals are available for pre-reservation for 2014. Contact Atlantic Realty for more information on the Outer Banks vacation rentals that have been added to our rental program for 2014. Atlantic Realty is excited to introduce a new program for their Outer Banks Renters, the Explore the Shore Guest Program. The Explore the Shore Guest Program provides specials from local business partners. Businesses throughout the Outer Banks have partnered with Atlantic Realty to provide deals for visitors. Island Revolution Surf Co. & Skatepark is located in the Corolla Light Shopping Center. Surf and skate lessons are available. For example, the company provides private surf lessons, semi-private lessons, group lessons, and skate clinics. Specials in the program include $5 off of surf or skate lessons, a free admission to the skate park on Wednesdays, and 10 percent off merchandise that is at its regular price. Corolla Adventure Golf and Bumper Cars has three nine-hole miniature golf courses. This is one of Corolla’s newest attractions. It is an entertaining experience for families. Each course has a theme related to the Outer Banks. Bumper cars are also available. Specials within the Explore the Shore Guest Program include playing 27 holes for $9 and playing 19 holes for $9. Bumper car rides are available for $6 per person. Bob’s Bait and Tackle shop has been open on the Outer Banks since 1982. The shop provides fishing equipment, daily fishing reports, T-shirts and hats, personalized service, fishing advice, and Outer Banks fishing charters. In this Explore the Shore Guest Program, you can have $3 off any T-shirt purchase. Bob’s Bait and Tackle shop is in Duck. Puzzles, Pranks and Games is located in Kitty Hawk and has a variety of jigsaw puzzles with Outer Banks landmarks well as pictures of our beaches. The store also has games, books, toys, chess sets, and a puzzle machine. With this program, you can receive 10 percent off any purchase. That Jewelry Store & More! is in Kitty Hawk. The store features a unique collection of jewelry, gifts, and works of art. Silver jewelry, copper jewelry, costume jewelry, charms, and custom jewelry are available. With this Explore the Shore Guest Program, you can have 10 percent off of any purchase from the store. Mmaxout OBX has many levels of fitness, cardio, and core classes as well as personal training, yoga, and kickboxing. Mmaxout is a full body workout. Types of training include strength, conditioning, and explosive interval training. Mmaxout OBX is located in Kitty Hawk. You can have 10 percent off of any class through the Explore the Shore Guest Program. Domino’s Pizza is located in Kill Devil Hills. Through this Explore the Shore Guest Program, you can receive two medium pizzas with two toppings for $5.99 per pizza. Domino’s Pizza can deliver from Milepost 4 to Milepost 16. Pickup is also available. The Snowbird Ice Cream & Grill is located in Nags Head. It is an ice cream shop and fast food restaurant. The restaurant is close to the beach and a unique Outer Banks shop. In the Explore the Shore Guest Program, you can have one free cake or waffle ice cream cone as well as 20 percent off of all food items. Logan’s Ice Cream Cottage is located in Nags Head. It is a nice place to visit for desserts and ice cream. With this program, you may receive one free cake or waffle ice cream cone. OBX Biplanes and Coastal Helicopter Tours is located in Manteo. You can see the beauty of the Outer Banks while flying in a biplane or helicopter. The company provides a variety of tours. From Sunday to Tuesday, you can take a 20 minute or longer tour and receive a free DVD air tour of the Outer Banks with the Explore the Shore Guest Program. Atlantic Realty is excited to provide the Explore the Shore Guest Program to our Outer Banks Renters with our Outer Banks business partners. Visit http://www.atlanticrealty-nc.com/explore-shore-guest-program for more information and for updates on specials by Outer Banks businesses. Spring is in full bloom and summer is right around the corner. Fortunately for our guests, this means super-fun, warm weather activities! Here at Atlantic Realty, we have an awesome program called Fun ‘N Sun that entitles our guests to a variety of fun activities for free! We have added a lot of fantastic items for 2013 and we hope that our guests this year will enjoy the new activities. If you’re busy planning an OBX vacation in the future, read on to find out more about our exclusive Fun ‘N Sun program. Kayak or Stand Up Paddleboard Rental – Enjoy one hour free when you rent a kayak or standup paddleboard at Kitty Hawk Kites. SUP is one of the hottest new trends to come to the OBX and you can take part when you visit either the Duck or Manteo locations. Roanoke Island Festival Park – Receive one free adult admission per day to the historic Roanoke Island Festival Park in Manteo during your OBX vacations. If you’re interested in checking out our fascinating history, nature, recreation and family activities, this is the place where you can go to have it all! Free Body Board Rental – From the Outer Banks Surf Shop in Duck, enjoy one complimentary body board rental to experience riding the waves and becoming one with the ocean! Free Adult Stationed Tour to The Whalehead Club – Located in Corolla, this historic house museum is situated on 39 acres of pristine waterfront property. Learn how it was restored from an old hunt club into a historic museum! Free Golf! – Choose either the Carolina Club, Nags Head Golf Links or The Pointe Golf club and enjoy a round of golf on us! Wild Horse Safari Tour – Looking for a fun way to catch a glimpse of the wild horses of Corolla? Take a wild horses safari tour with Back to Country Outfitter’s and we’ll treat you to one complimentary adult admission per day! Remember your camera for this unique photo opportunity! Free Photography Seating – Want to capture the memory of your family’s OBX vacations? Schedule a photography session with Photography by Geri and you’ll receive a complimentary photo session. This deal is offered year round! Free Garden Pass – With every changing season you’ll have a whole new reason to visit the Elizabethan Gardens! Bring the whole family and bask in the beauty that these magnificent gardens have to offer! Free Mini Golf – Spend some quality time with the kids this vacation. With one complimentary round of mini golf per day at The Promenade or DQ Family Fun Center, your kids will be talking about this OBX vacation for years to come! Sunset Cruise – Looking for a unique way to enjoy one of our beautiful sunsets? Look no further than Outer Banks Cruises. With one free adult admission per day, you have no reason not to witness an extraordinary sunset from one of their luxurious boats! Beach Chair Rentals – Did you forget to pack those beach chairs? No worries! Grab a couple at the Just for the Beach Rentals and enjoy the use of 2 on us. If you’re interested, they also offer bicycle rentals, beach umbrellas, kayaks, baby equipment and more to make your vacation simple, fun and stress-free! One Free Admission-Horseback Tour – Want a little adventure this vacation? Take a two hour horseback tour from Equine Adventures that the whole family can partake in! With over $225 per day in added amenities, this program is provided to all of our guests staying in one of lovely vacation homes. We want you Outer Banks getaway to be the best it can be, and with these free activities and amenities you won’t ever find yourself asking what to do next! For more information about these activities, contact Atlantic Realty Fun ‘N Sun Reservation Center at 855-680-7853 to schedule tee times and to make reservations for your fun and free activities. Remember that these activities cannot be reserved more than 48 hours prior to check in and you must have a valid credit card number in order to place your reservation. Check out our Fun ‘N Sun program page for more info here! Save Money by Choosing Outer Banks Vacation Condos! We were discussing how to promote our condo rentals vs. hotels rooms and the value that families would get with more space, a full kitchen, etc. for an average of less money per night. Have you been dreaming lately about sandy shores, sunny skies and rolling waves? If you’re in need of a family beach vacation, then you’re in luck. Want to start planning a family vacation to the Outer Banks soon? Well, you’ve come to the right place. Atlantic Realty has some of the finest and more affordable vacation rentals available in the Outer Banks. If you want to get the most out of your beach vacation, an Outer Banks vacation condo may be the best choice for you and your family! Many people take the traditional route and decide to spend their getaway at a hotel. Not only will you not have the same amount of privacy as you would in a condo, but you will be paying much more for the experience. With an Outer Banks vacation condo, you’ll have access to a full kitchen, multiple bedrooms and bathrooms, entertainment, community pools, tennis courts, basketball courts and more. If you want your vacation to be comfortable, affordable, convenient and fun then skip the drab hotel room and spend your getaway in a cozy, beach inspired condo. When you stay at a hotel you could be spending up to a couple hundred dollars a night for a room, a couple of beds and a bathroom. With our Outer Banks vacation condos, you’ll have access to all that and so much more, with rates as little as $450 a week! With deals as great as that, why would anyone choose to stay at a hotel? Check out some of our terrific Outer Banks Vacation Condos that are up for grabs this season! You’ll certainly feel lucky snagging this semi-oceanfront condo. With access to a community pool, playground, basketball and tennis courts, a flat screen cable TV/DVD, and tons of books and games, the kids will be kept entertained all vacation long. Relax and give yourself some much deserved “me” time. The master bedroom and bathroom have been completely renovated, allowing you to bask in luxury this vacation. With the Town of Duck just a short walk away, you and the family will have convenient access to great local eateries, unique shops, and lots of cool OBX activities, events and adventures. For more information and to check out photos of this gorgeous property, click here. Bring the whole family to this condo that accommodates 6 and is equipped with 3 bedrooms and 2.5 bathrooms. Located in the Nantucket Village, you’ll have access to tennis courts, a boat ramp, a pier (complete with a gazebo! ), an indoor heated pool, and the ocean and the Town of Duck Soundside park and boardwalk is just a short walk away! With a large, fully equipped kitchen, a Jacuzzi tub, 3 televisions and high speed internet, you’ll feel like you’re living in luxury in this home away from home. When you’re watching the sun go down on the back deck, you’ll be wondering why you didn’t plan this family vacation sooner! Check out this property here. This first floor, oceanfront condo provides everything you need for a fantastic vacation! With bright, beachy colors, you will always feel like you’re on a tropical vacation! With direct access off your balcony to the pool and to the beach, paradise is only a few steps away. With 2 bedrooms and 2 bathrooms, this property accommodates 4. Located in Nags Head, you will be in the center of some of Outer Bank’s best attractions, including Jockey’s Ridge State Park and Jeanette’s Pier. Tempted? Find out more about this property here. These are just a few of our many fantastic Outer Banks vacation condos. Check out our Outer Banks condo rentals page to get more information, find rates or check out photos. Browse properties, compare rentals, look at photos, and more. If you’re dreaming of a fun and affordable beach getaway that’s sure to please the entire family, Atlantic Realty is the one for you! Announcing our New Look Here at Atlantic Realty! Attention all residents and visitors of the Outer Banks! Here at Atlantic Realty, we are thrilled to be unveiling our new company’s brand new look to the public. We are a locally owned company in the Outer Banks that strives to provide only the most professional and friendly service to each one of our homeowners and vacation rental guests. We believe that our new logo will reflect all of the cutting edge innovations we use to make your rental property a success. If we haven’t had the pleasure of serving you, either as a vacation rental guest or a homeowner, allow us to introduce ourselves. We are a moderate sized business that has chosen to remain so in order to maintain personal relationships with our homeowners and to deliver immediate attention to every vacation rental guests. Despite our size, we have a state of the art reservation system that is intended to provide convenience and ease of use to our customers planning vacations in the Outer Banks. There is no comparing what we offer our guests when it comes to their vacations in the Outer Banks. Unlike other companies, we don’t charge for your first pet if you choose to bring along any of your furry friends and we also don’t charge for any obnoxious credit card processing! With our Fun ‘N Sun Program, we offer free activities and amenities during each day of our guests’ vacations in the Outer Banks. Enjoy complimentary activities such as one round of golf and one Wild Horse Safari Tour per day, an Outer Banks Pier Pass, the use of two beach chairs and much, much more. Want to go bowling or play a round of Mini Golf? Play a game, on us! One of our other popular extras is a beautiful Sunset Dolphin cruise! Excited to vacation with us yet? You should be. We have tons of new activities that will be offered in 2013, such as a free Kayak or Stand Up Paddleboard (SUP) Rental or a complimentary admission to the Roanoke Island Festival Park. There are so many more activities and events to choose from. We love to see our guests enjoying their vacations in the Outer Banks and we strive to do whatever possible to make this happen! We greatly appreciate all that these beloved barrier islands have to offer and one of our primary goals is to ensure that you do as well. Here at Atlantic Realty, we have a growing team of bright and talented customer services professionals on staff who are ready and waiting to make your vacations in Outer Banks a success. We pride ourselves in offering only the most friendly and personable service. However, we don’t stop there. Our team has continually been working hard to raise that bar. We are now able to offer even more guests a reason to vacation in Outer Banks and even more weeks in which to do so. We hope that our new fun and colorful logo will become a symbol of all the hard work that our staff has put into our business, as well as all of the goals we have completed and those that we continue to make for ourselves as a business. We know that you will love what we can do and we hope you love our new look! Atlantic Realty would be honored to be the place “Where your Barrier Island experience begins.” Start booking your vacations in the Outer Banks with us today! Announcing the Winners of the 30th Anniversary Photo Contest! Here at Atlantic Realty we’ll be celebrating our 30th Anniversary and so we’ve been busy gearing up for a full year of fun contests, awesome promotions and giveaways! During this year, we’d like to celebrate the growth of our company, along with that of the Outer Banks. When Atlantic Realty emerged in 1982, Duck and Corolla were only accessible by a dirt road and many of the vacation rental homes didn’t even have air conditioning. Not only that, but most of the cottages didn’t have telephones of TV! Now luxurious Outer Banks vacation rentals are scattered all the way from Carova to South Nags Head, numbering over 25,000. Looking back now, it’s amazing to see how far we’ve come as a community and as a company. Now when you stay in one of our Outer Banks vacation rentals, your temporary home away from home will be equipped with the latest technology and luxurious amenities including private pools, hot tubs and theater rooms. Here at Atlantic Realty, we’ve been lucky have had certain outer banks vacation rentals in our program ever since the beginning. We’ve also been honored to be serving some of the same homeowners and guests since 1982 as well! We’ve committed ourselves to making sure that your family has the most memorable Outer Banks vacation ever and it’s that dedication to customer service that seems to keep everyone coming back year after year. We are so thankful for these people and would like to show our appreciation throughout the year. By choice, we’ve remained selective and moderate in size as a company in order to provide only the most personal and immediate service to our valuable homeowners and vacation rental guests. We are a locally owned company that calls the Outer Banks our home. We are very neighborhood oriented and we are eager to share our experience and knowledge with you when you decide to stay at one of our many gorgeous Outer Banks vacation rentals. To kick off our celebratory year, we announced a Facebook Photo Contest. We asked our fans to send in their captured memories of Outer Banks. We asked them to send us any vintage vacation photos they might still have and share with us their fond memories of the OBX over the years. We loved the responses that we received. It seems that Outer Banks vacation rentals have been a favorite family vacation spot for people everywhere! The photographs were heartwarming and it was wonderful to hear so many dear stories of vacations past. We’d like to congratulate our winners of the Facebook Photo Contest for receiving the most votes. Our 1st place, Grand Prize went to Larry Snow for his awesome photograph titled “1980’s Surf Fishing.” Larry was awarded a 3 night stay in one of our exquisite oceanfront Outer Banks vacation rentals in Duck. Our third prize went out to Mary Burris for her beautiful photo, “Kid on the Beach with Guitar.” Her prize was a $100 Gift Certificate to Kelly’s/Mako Mikes/Pamlico Jack’s Restaurant. Great job guys! Want to check out the award winning photos? Keep posted on Atlantic Realty’s Facebook page. For more information on our other promotions and upcoming giveaways, visit us at our website and check back often for more news and updates! Imagine surprising your special someone with a weekend or week-long Outer Banks vacation. We have had so many guests do just that. One of our favorites is this couple from Charlotte who came to spend a few days on the Outer Banks. The ‘groom to be’ had it all planned out with our assistance. His fiancée had no idea what was to come (she actually thought he was about to break up with her). After a nice walk on the beach, he got down on one knee and proposed. When they returned to their vacation rental, we had left a bottle of champagne, chocolate and roses to help them kick off a perfect weekend. Because we love Valentine’s Day, we want all of our guests to enjoy this romantic holiday at one of our Outer Banks vacation rentals in Nags Head, Corolla or any other town in our island paradise. We have come up with our Valentine Vacation package to make it that much more memorable. Simply book three nights and get the fourth night free or get 15 percent off the weekly rate at one of our participating Outer Banks vacation rentals. As a bonus, we also provide guests with a complementary bottle of champagne, heart-shaped chocolate and a beautiful red rose to help kick off a romantic trip. The Outer Banks is a popular place for engagements, weddings and honeymoons and there is no better way to begin than with fabulous accommodations through Atlantic Realty. To take part in the Valentine Vacation package, trips must be booked between January 11 and February 11, 2013 for reservations between February 9 and February 23, 2013. Other incentives include free early check in/late checkout and no pet fee on participating pet friendly rentals during the promotion dates. Let us help you celebrate Valentine’s Day. The Outer Banks is such a perfect destination for love and romance. We will make it one to remember! Contact us at (877) 858-4795 to make reservations and let us help make plans for a special surprise. Just in time for vacation planning to begin, we added six new properties to our huge selection of OBX vacation homes and condos. Some are large and accommodate multiple families while others offer that quaint, old style beach feeling of yesteryear. No matter the design, the homes are perfect additions to Atlantic Realty and we are very excited to have them. Added to the list are updated vacation rentals with great amenities to make vacationing in the Outer Banks easy and fun. While some feature wonderful ocean views and quick beach access, others offer private pools, high speed internet and even allow pets. Even more features found in our new Outer Banks vacation rentals located in Nags Head, Kill Devil Hills and all of the other OBX towns are spectacular ocean views, and elevators to make loading and unloading easier for guests. To view our new homes and all of our other OBX vacation homes, download the new Atlantic Realty free mobile app from iTunes and Android app stores. With this app, you can view properties and begin to plan your next Outer Banks vacation as well as check out some of the things to do while on vacation. Registered guests have access to a “guest portal” to get information about their vacation rental as well as check out some of the “Fun-n-Sun” offers available exclusively to Atlantic Realty guests. The Outer Banks is a great place for summer vacations and all year long. People come back year after year to visit our little slice of heaven. After all, US News and World Report voted it the #1 Best Family Vacation Destination for 2012. Atlantic Realty offers many choices for accommodations in the Outer Banks with vacation rentals from Nags Head to Corolla. Make sure to check out our new OBX vacation homes when making your plans. For more information on the new rental homes and any others, contact Atlantic Realty at (877) 858-4795. Atlantic Realty, a premiere Outer Banks vacation rental and real estate company, announces the launch of its free vacation rental mobile app. Intended to make trip planning easier and more convenient, the app includes features for any user whether they are just browsing Outer Banks information or have made reservations, with Atlantic Realty for their next vacation on the Outer Banks. The app provides information necessary before, during and after a vacation such as planning tips, directions to each property, property details, and area information, as well as restaurants, events, and activities selected by Atlantic Realty. Not only can registered guests and visitors check out each and every vacation rental, they can get detailed GPS directions to each property as well as restaurants, activities and events. Another feature for registered guests of Atlantic Realty is the Fun-n-Sun section that lists all of the complimentary activities associated with this exclusive program. The Outer Banks Fun-n-Sun program is exclusive to registered guests and provides free passes and amenities for activities and more. Guests can also go to “Concierge Services” to contact representatives who will book reservations for them as well as make suggestions on things to do in the Outer Banks. The Atlantic Realty vacation rental mobile app is designed to take vacation planning to the next level. It is currently available for iPhone and Android users as well as on platforms like Google Play and is essential to planning a great vacation in the Outer Banks. For more information, visit Atlantic Realty at www.atlanticrealty-nc.com or call Atlantic Realty at (855) 885-0466 to speak to one of the representatives. The late Fall is a beautiful time to schedule Outer Banks vacations, and Atlantic Realty is helping friends and family find Outer Banks lodging for the holidays. Thinking of celebrating Thanksgiving, Christmas, or any holiday on the beach with close friends and family? Atlantic has many options for Outer Banks vacations for the holiday season. Finding Outer Banks lodging is easy for Thanksgiving by booking a rental with Atlantic Realty. Book now and Atlantic Realty will include lots of savings on your Outer Banks vacations to help your family enjoy a stress-free holiday by the ocean! Atlantic Realty will include a free additional night with any 3 night stay during the months of November and December. If you plan on visiting for Thanksgiving you can spend a week on your Outer Banks vacations with us for just $3,400 at our Beach Divas home! Saving your family cost on rent on Outer Banks lodging is only the beginning of the ways we will work to make your Outer Banks vacations memorable for the holidays. Atlantic Realty is also providing Outer Bank lodging at a convenience to our guests. Book Outer Banks lodging during November and December and Atlantic Realty will provide free early check in and late check outs. The holidays can be stressful enough so Atlantic wants to make sure your family’s Outer Banks vacations isn’t rushed and you have the time you need to arrive and leave at your leisure. Families don’t have to worry about leaving their favorite pet at home because Atlantic Realty is also allowing pets to stay for free in pet friendly homes. In addition to our big savings on Outer Banks lodging, Atlantic Realty is also helping take care of the Thanksgiving dinner! Book Outer Banks vacations with Atlantic Realty during November and December and we will throw in a free $50 gift card to spend on groceries. All totaled you can save $650 by booking with Atlantic Realty during your holiday Outer Banks vacations. Use the promo code, FEAST2012 to take advantage of this special offer. Offer good on Outer Banks vacations for arrivals on or after Thursday, November 1st, 2012 and departure on or before Monday, December 31st, 2012. Valid at select Atlantic Realty Outer Banks lodging properties. For a full list of participating Outer Banks lodging properties visit Atlantic Realty at http://www.atlanticrealty-nc.com/spend-your-holidays-obx. Runners often seek OBX vacations because our part of the country is ideal for outdoor enthusiasts. For runners, the Outer Banks is perfect because of our mild temperatures and constant ocean breeze. The very popular Outer Banks Marathon is a 3 day event coming up on Veteran’s Day weekend (November 9-11) that allows running enthusiasts to experience how special OBX vacations are. This is the 7th running of the marathon and the weekend offers something for everyone. Atlantic Realty is happy to offer big savings for runners on our Outer Banks vacation condos and homes. If you’re not a runner those planning their OBX vacations in early November will still enjoy the race. What makes the Outer Banks Marathon unique is the “Beat the Bridge” aspect of the race. Runners have until 1:00 to make it over the bridge at mile 22. To “Beat the Bridge” runners need to maintain a pace of 16 minutes per mile. The marathon includes different races including a full and half marathon, a wheelchair division, and the Outer Banks 8K. The Outer Banks 8K is a “back yard” tour of the Outer Banks, starting in Kill Devil Hills and continuing through the Nags Head Woods Maritime Forrest. It is partially on a dirt road and walker-friendly. OBX vacations are best in the fall when the crowds die down and runners will experience a great atmosphere of support for this year’s marathon. Our Outer Banks vacation condos are perfect for athletes, their families, or fans of the event. Atlantic is offering runners lots of specials so plan your OBX vacations with us. For marathon runners Atlantic is offering free early check in and late check outs. Atlantic Realty also makes runners’ OBX vacations relaxing with a discounted spa package that includes a massage. It’s the perfect way to wind down after a grueling run! Vacationers can also enjoy our Outer Banks vacation condos with a gift basket that includes fresh fruit, bagels, and more. Atlantic Realty is also offering runners who stay at our Outer Banks vacation condos with discounted coupons and/or gift certificates to Outer Banks Running Company. So remember to choose Atlantic Realty’s Outer Banks vacation condos available to runners, family, and fans of the Outer Banks Marathon. Atlantic looks forward to seeing all the fans and runners on your OBX vacations in November, and wishes all the runners good luck in the race. Atlantic Realty has been a staple of the Outer Banks for over 30 years now, and it’s important to us to do what we can to make the Outer Banks a better place. Atlantic Realty prides itself on being an active member in many Outer Banks events. Atlantic Realty is a proud participant of the following Outer Banks events, and encourages your support in these great causes! The Outer Banks Hospital’s Get Pinked Campaign is one of our favorite annual Outer Banks events. Get Pinked launched in 2010 and is dedicated to raising money and awareness for breast cancer. 100% of the proceeds from this campaign stay in the Outer Banks, in Dare County. Many Outer Banks events focus on fitness and the American Cancer Society’s Relay for Life is one example of a fun way to give back in the Outer Banks. The Outer Banks Chapter is the most generous in the nation, with over $175,000 raised in 2010. Atlantic Realty averages over $2,500 annually by selling raffle tickets and holding other fun Outer Banks events to fundraise for Relay for Life. The Relay for Life takes place in the Outer Banks in May and teams walk 24 hours to raise funds and awareness to help cancer research and fund treatments for cancer patients. Another of our favorite annual Outer Banks events is the Surfrider’s Annual Big Sweep. The Big Sweep is an important event to help keep the Outer Banks beaches clean and safe. Dare County residents have supported this event since its inception in 1987, and Atlantic Realty is proud to sponsor this annual event at several beaches around the Outer Banks. Atlantic Realty’s commitment to the Outer Banks reaches far beyond local fundraising events. Atlantic Realty is also proud to sponsor many local organizations and other Outer Banks events that do great things for the community. We sponsor organizations like Goodwill, the Outer Banks Food Pantry, the Outer Banks Hotline Crisis Center for Women, and the Outer Banks Hospital. We also sponsor the Duck Jazz Festival, the Outer Banks Patron of the Arts, Elizabethan Gardens, and many other events and destinations in the Outer Banks! Atlantic Realty is proud to sponsor such worth-while causes in the Outer Banks, and as the Outer Banks continue to become a popular summer destination, we encourage our guests and fellow community members to do what they can to make the Outer Banks an even better vacation destination! When it comes to having a ride you will always remember you can’t beat the September OBX Vacations North Carolina HOG Rally for fun. The hot summer days are behind us now, and the nights are cool enough to enjoy that beach breeze in your face. This is the perfect time to plan a great week of bike OBX Vacations fun and hog rally riding at an incredible location. When you combine the legendary beaches vacations in the Outer Banks with the thrill of a huge HOG rally you get the perfect blend of fun and sun for a ride to remember. Don’t store that bike you love just yet! This September will be a great time to pull that bike out of the garage and join your fellow bikers on a very fun-filled OBX Vacations week of rides, get-togethers and site seeing as you can only do and enjoy from the seat of a bike. The annual North Carolina H.O.G. Rally will be an OBX vacations celebration to remember for years to come. Take an OBX Vacations self-guided ride along “The Beach Road” also known as Router 12, participate in the Lighthouse Ride or Poker Runs or join us for a HOGs on the Beach Party and more. There are tons of great places to eat, dance and even historical sites to see. When it comes to fun vacations in the Outer Banks, you won’t want to miss this one! If you are thinking of maybe rolling some extra fun time into the rally, why not rent an OBX vacations home for the week from Atlantic Realty and really have a great time! You can find all kinds of great specials when planning your fall vacations in the Outer Banks with Atlantic Realty like free stays for your pet at our pet friendly OBX Vacations homes and free early check in and late check out this fall. The rally runs from September 27th through the 29th giving you plenty of time to enjoy Atlantic Realty OBX Vacations three day specials that give you a fourth night for free. So come on out for our great food, friendly folks and wonderful beaches. The North Carolina H.O.G. Rally is just one more great reason that when you plan your vacations in the Outer Banks you are never disappointed.